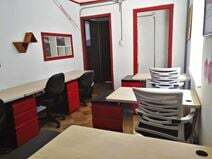 This coworking office also offers ways to design your office or your space that you rent. In order for you to be productive and comfortable, the design team will help you customize your office and your space in order for you to feel alive and productive all day. This coworking space also offers a perfect space for you to create and event. This coworking space is in a very exclusive part of the city. This office can give you guidance for your project and this office also commits to work collaboratively with every client. This office offers you individual work spaces, management offices and meeting rooms with the capacity for up to 80 people. This office also gives you access to the Entrepreneurship and Networking events. You do not only build your empire at this office, but also learn from other entrepreneurs. Complex regulatory environments, an increase in risk in many areas, the growth of the digital economy. and increasing pressures to reduce costs. At this beautiful office there is food to be served. If you feel homesick there is a chef that can make a delicious homemade meal. This coworking space you can also network with many people from other parts of the world. This coworking space is also close to parks where you can go for a run or a walk after work to keep a healthy lifestyle while you build your empire. This office is located near Luckia Casino and this is the perfect entertainment for your clients. Is a perfect way to build a relationship with your client as you can take them to gamble or play poker and from there take them to a near restaurant to celebrate a new partnership. Rock and Jazz Casino is also nearby this office and you have multiple choices to choose to which Casino to take your client. This office is located near Bodytech where you can go and work out after work in order for you to maintain a healthy lifestyle. This office is also located near many parks where you can go walk or for a run in order to keep your mind and body active in order to be energetic all day. There are many exclusive activities you can engage while you work in this office. There is also many activities in order to entertain your clients and start building a relationship with them. This is the office to work while you can feel productive and inspired all day. For your company, it is not only the first step to start your business idea; but also, it is one of the most difficult elements, because it must have different specifications, according to each particular business model. 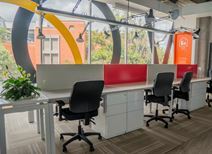 This office has become the business center of Bogotá, ideal for entrepreneurs looking for modern spaces, furnished, comfortable and variable according to the image they want to show. This coworking space shares the neighborhood with the World Trade Center of Bogotá and many luxurious hotels. It is close to many parks and you can go for a walk or a run after work to keep a healthy lifestyle while you are building your empire. There is also a shopping center nearby so you can go shopping. It is also close by Casa Dann Carlton Hotel & Spa and you recommend your clients if they are travelling from other countries or a different city to stay there. This office has ideal parking for your clients and for you. Now you will not have to worry about if your client has a vehicle, this office will also help you with that. You do not have to worry about the services or the administration, the prices will include these elements so you will always feel calm. This office also has virtual offices that are the perfect and efficient solution for the needs of those who do not require a permanent work space, but all the administrative support that allows your company to provide the corporate image you have always wanted. This coworking space is close to a shopping center and also is close by many casinos. There is many ways you can entertain your clients at this coworking space or near the coworking space. There is also many incredible hotels where your clients can stay at. The Bogota Beer Company is also close by where you can take your clients or team to build a relationship with them. This center offers its clients a working environment driven by cooperation in which each member, without necessarily having a direct relationship between them, can belong to a community that seeks to strengthen and grow through coworking through values of collaboration, sustainability, accessibility and opening that stimulate the environment. This coworking space believe to unite not to be together, but to do things together in order to offer better products to the world. This center is very green and also offers natural light. The neighbourhood of Chico Norte is renowned for being rich in culture and parks, but is also perfectly located for coworking office space. This centers third location in Bogotá, this building is accessible on foot, by bike or car, and store the latter two safely in dedicated areas on site. Just five blocks in both directions from Zona Rosa and the beautiful Parque 93 area, this location is spread over seven stories in an entrepreneurial area that also attracts established enterprises. This extensive and highly professional corporate building provides state of the art and technologically innovative workspace solution packages, ideal for tenants and working professionals of any industry or corporate background. The site provides spacious meeting rooms, conferencing capabilities, high speed internet connectivity, secure parking provision and a range of other on-site facilities ideal for any client requirement. Offices to let in a highly prestigious Bogota business centre. This building is ideally located, being near prestigious hotels, a range of restaurants, shopping, and the city's Banking Zone. There is good public transport access, and easy access to the international airport. First-class offices to let in the Teleport Business Park, in the north of Bogota. The centre features 24-hour access, meeting rooms, parking and video conferencing facilities. The area has a range of amenities, including banks, shopping centres, hotels and travel agencies. Fully furnished and serviced offices to let in Bogota. These offices feature a range of facilities, excellent security services and state of the art technology services, as well as virtual offices and boardrooms. The centre is located in a highly prestigious district of Bogota, and has excellent transport links and fine streetscapes and spaces. This coworking location offers clients with a multitude of options to choose from including serviced office suites. Flexible pricing terms and a staff that is motivated to help you succeed are what separates this space from its competitors. A long list of premium amenities provides tenants with access to all of the tools needed for success. This coworking space is location in the Bogota area, close to many of the city's best restaurants and activities. A modern centre providing a range of office-spaces that arrive fully furnished available on flexible terms. The work-spaces benefit from air-conditioning, high-speed internet and large conferencing suites. A friendly welcome desk is also provided that can handle administrative duties. Spacious meeting rooms are provided on-site as well, perfect for collaborative purposes. In terms of transport, the centre is well connected via road and rail links. The local train station is only 2 miles away, whilst the city itself is easy to navigate using the frequent bus routes that pass nearby. El Dorado Airport is also easily accessible, providing more global connectivity for your aspiring business. Members of this co-working and private office space are inspired by galleries of murals by local artists and two sun terraces to relax on. The newly renovated building is in close proximity to some of the most prestigious bars and restaurants in the city making this one of the most exclusive addresses in Bogota. 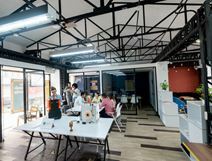 This Bogota CoWorking center offers multiple office options that range from meetings spaces to fully furnished office suites, including CoWorking space. Tenants will find that this center offers more than just space, it offers a place that people can call home. This center was designed to stand out while also conveying a productive atmosphere. You will be hard pressed to find a better CoWorking space. A stunning business centre featuring an array of useful services including high-speed internet, meeting rooms, reception and daily maintenance. All work-spaces benefit from plenty of natural light throughout the day and can be rented on flexible terms at affordable prices. The location is ideal, situated in a vibrant district surrounded by other commercial entities. Public transport links are numerous, making the centre easily accessible via road, rail and air links. This superb centre occupies a prestigious building in the heart of Bogotas financial district. The area is filled with many fine restaurants and hotels. A full range of offices are available on flexible terms. The regional transport links available throughout the locality and its surrounding districts are also excellent and offer a multitude of frequent and convenient services in operation throughout the region, making the site easily accessible. Bogota’s exciting city vibe supplies a variety of restaurants from across the globe, a large quantity of retailers, comfortable hotels and great access to banks and ATMs. Also found in the area are art galleries and other cultural and leisure venues. Just 20 minutes drive from El Dorado Luis Carlos Galan Sarmiento Airport, this centrally located space is convenient for your travel needs. Flexible office space boasting beautiful designer offices in the heart of Bogota. Inspiring and creative working environment perfect for sparking entrepreneurship and creativity in collaborative space where you can connect with like-minded professionals while grabbing a cup of coffee, while utilising the business club or exclusive rooftop terrace. This new business centre has impressive architecture and facilities and great views of Bogotá and its surroundings. Central within Av. Chile, the complex is in ideal business environment. The centre is close to upmarket hotels, restaurants, retail outlets and accommodation. Located in the centre of Bogota, this office tower provides stunning views, and offers a range of office spaces to suit your requirements. The building is a short walk from an amazing selection of hotels, restaurants, shops and banks, and is easy to access. We are strategically located in the international center of Bogotá just ten minutes from El Dorado Airport with excellent access for public and private transportation. Is also walking distance from el Parque de la Independencia and can go for a run or a walk after work to relax. Located in central Bogota this high quality business center is on the 17th floor of a distinguished 29-story architectural building that provides stunning views over the city. Certified by the U.S. Green Building Council in the LEED category the private suites, reception services, co-working space, meeting rooms and business lounge are complemented by a luxury hotel, gym, spa, pool and a 280-seat auditorium. These prestigious serviced offices offer an impressive lobby area, full conference facilities and excellent quality office facilities. They are located in the most prestigious part of Bogota City, and have direct access to the highway network, as well as being only 20 minutes’ away from the El Dorado International Airport. This fine part of the city has a range of top quality hotels, fine dining and shopping, and the city's best nightlife. Close to Autopista Norte this business centre has an excellent location in the north of Bogota. Each co-worker gets one hour a day free use of the meeting rooms and have access to a great garden area with comfortable beanbags. Office space available in a major business centre in Bogota. This is one of the most sought-after business centres in the country. It is located right in the heart of Bogota, providing an excellent base for your operations. This modern new build office building provides a prominent and commercially significant location in the heart of the city and is surrounded by vast green spaces, representing an idyllic and hugely prestigious working environment. Tenants have access to great public transport links and local amenities as well as a choice of private executive office space, co-working areas, on-site business support staff and meeting rooms. Less than a half hour drive from the region's main major airport and set directly within the heart of Chicó, Bogota"s bustling central business district, this phenomenal business center location provides exquisitely furnished serviced office suites and open, collaborative workspace solutions from within an impressive LEED-certified building in the city's most highly sought-after and vibrant corporate district.